Samia Halaby opens her first solo exhibition at Birzeit University Museum on 22 February. Halaby has participated in collective exhibitions at the university in the past, and led workshops for students there in the 1990s. 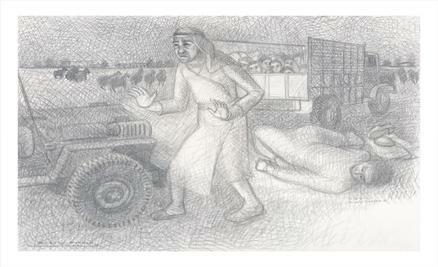 She returns to Birzeit with an exhibition that highlights a selection of prints from her Kafr Qasem Massacre series. The Jerusalem-born artist will also launch her latest publication Drawing the Kafr Qasem Massacre (Amsterdam: Schilt Publishing 2017), which describes her research on the subject and work on the series of documentary drawings over the span of thirteen years. Featured alongside these prints, which Halaby has gifted to the West Bank institution, are three recent paintings by the artist from her Illuminated Space series, a body of work that explores luminosity in abstraction. The exhibition Samia Halaby: Documentary Drawings of the Kafr Qasem Massacre/Illuminated Space is on view until 30 May, and includes a catalogue with essays by New York-based art historians Dr. Barbara Stehle and Maymanah Farhat.